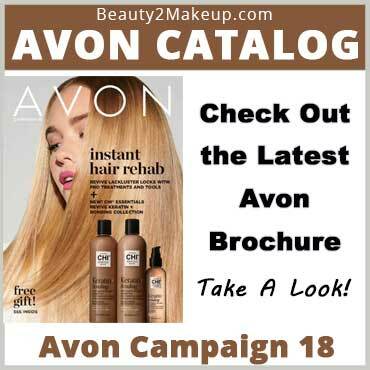 Step Into Spring with the Avon Campaign 8 Brochure! With winter soon to be behind us and the newness of spring ahead it’s a great time to celebrate the new season and to try something new. Spring is all about out with the old and in with the new so freshening up your makeup supply is a good place to start. Mascara should be replaced every 3 months to keep your lashes healthy so make sure to replace it with a fresh new tube. Right now select Avon Mascaras are on special when you Buy 1 and Get 1 Half Off. You’ll also save on other makeup essentials like Eye Shadows and Eye Liners so make sure to take a look at the Makeup department as your checking out the current brochure. Speaking of new, in the current Avon Catalog, Avon introduces Glimmershadow Liquid Eyeshadow! This new buildable coverage liquid eyeshadow stays on all day, won’t crease, won’t smudge or transfer. It comes in 5 Glittery shades and 3 Shimmer shades at a special introductory price of only $5.99. In campaign 8 Avon also introduces new Brightening, Calming & Smoothing Sheet Masks for only $2.99 each. Each mask is sold individually and infused with natural ingredients to maximize results! After the long cold winter, Spring is the perfect time to refresh and rejuvenate your skin! These special offers are going on over at Avon all thru March, plus I’m personally throwing a little added incentive to sweeten the deal! Make sure to scroll all the way down for all the details! All through March when you place a $50 order, Avon will send you a 20% Off coupon on your next $50 order in April! Avon will email the coupon sometime between April 1 – 8, so if you take advantage of this offer make sure to check your inbox during that time. Now, Let’s Sweeten The Deal! Along with the above offer, I’ll personally send you a free Avon Sheet Mask. These are Avon’s newest skin care additions newly released in Campaign 8! You’ll get to try one free just by placing your $50 order in March. If you’ve already placed a $50 order this month then keep an eye out for your free mask! I’ll be sending it out soon! *One mask per $50 order. It will be shipped separate from your Avon order as I will ship it to you personally. Here are a few things to keep in mind while you’re shopping at my Avon Online Store. All orders $40 or more get Everyday Free Shipping! You can get Avon’s current Your Spring Essentials A Box for just $10 with any $40+ purchase! ​​​​​​ Avon’s Limited Edition Spring & Easter Collection has arrived! Avon seasonal items have a tendency to sell out fast and these cute bunny & spring items will definitely be popular. Plus you’ll want to check out all the other great deals found in the current Avon Catalog! You’ll Find All This Plus More in the Campaign 8 Avon Brochure! Ask Me, Your Independent Avon Representative!